American Yogini Lori Tompkins uncovers the veiled significance of Vedic symbols in her new book "Geometric Keys of Vedic Widsom". I will forever remain stunned by the way the key of the vesica piscis was brought forth in my consciousness. It was organized and accomplished despite my ignorance of what was being accomplished. In her self-published book, “Geometric Keys of Vedic Wisdom”, Lori Tompkins tells the sometimes stranger-than-fiction story of recovering hidden keys of the Rig Veda. Her story begins with a vision of the Vesica Piscis, which subsequently leads her to many original discoveries regarding the ancient lore of Vishnu’s avatars, the Indian Yugas, the Rig Veda, St. John’s Revelation, as well as many other commonly known world mythologies. “Geometric Keys of Vedic Wisdom” exposes the math underlying a wide array of world mythologies, symbols and sacred traditions. It is full of quotes from the Rig Veda and other sacred texts, as well as from the works of Indian yogi, Sri Aurobindo (1872-1950) who is the author’s chief spiritual guide. In conjunction with clarifying various misunderstandings of the Vedic Year (a.k.a. the Zodiac), the book conveys the ancient sense, origin and purpose of Yoga. Author Lori Tompkins grew up in Virginia and received her BA in English Literature from the University of Virginia in 1991 and an MA in Education at the University of Colorado Boulder in 1994. Lori has been a student of Supramental and Integral Yoga since 1993 and she lives and teaches Hatha Yoga in California. Her favorite activities are mountain biking, dancing and gaining higher perspectives of old ideas and beliefs. 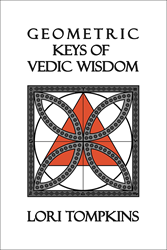 “Geometric Keys of Vedic Wisdom” is available for purchase on Amazon.com @ http://a.co/3jOp2dh. For additional information or media inquiries contact 360Lotus Press at 415-720-1425 or visit http://www.360lotus.com.